With the experience of two decades, we are able to Manufacture, Export and Supply Vertical Bandsaw Machines in India and abroad. The offered Vertical Band Saw Channel Body Machines are automatic device having strong construction and can cut hard material, wood and metals. 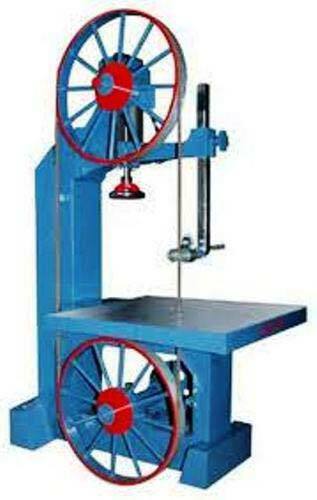 Made up of the finest material, our Machines are durable and easy to operate. And, we offer them at modest prices. Wheel Die 12" 18" 24" 30" 36" 39" 42"
Width of Wheel 1 ½" 1 ½" 2" 2 ½" 3" 3" 3"
Max Length of Saw Blade 10" 12 ½" 14"-3" 18" 22" 22"-6" 24"
Size of Table. 17 ¾" 21 ½" 27" 35" 40" 41" 41"
--- 17 ¾" 23" 28" 36 ½" 42x½ 43" 43"
Height from Floor to table. 35" 24" 29" 33" 37" 38" 39"
Distance from Saw Blade to Frame. 12" 15" 21" 27" 32" 36" 38"
--- 1½" 1¾" 2" 2½" 2¾" 3" 3"